Three-dimensional map of structural stability of compounds formed by combining sp-valent elements with d-valent elements. The stability regions of the different crystal structures (polyhedrons) are spanned by descriptors that are based on atomic volume (V), number of electrons/holes (N) and electro-negativity (EN). 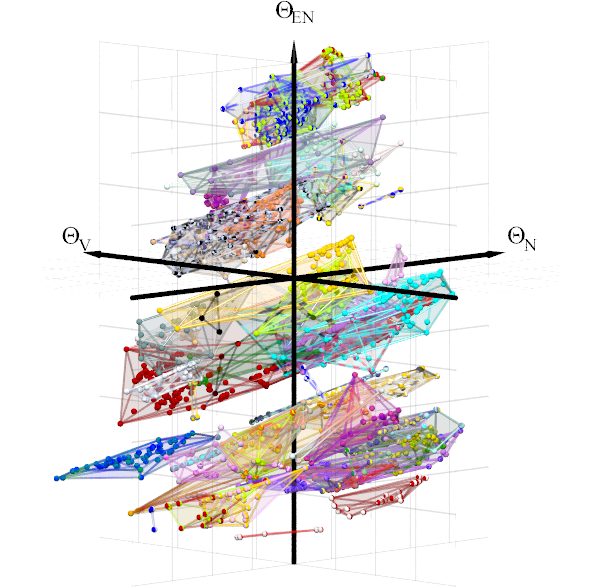 We present a three-dimensional structure-map based on experimental data for compounds that contain sp-block elements and transition metals. The map predicts the correct crystal structure with a probability of 86% and has a confidence of better than 98% that the correct crystal structure is among three predicted crystal structures. The three descriptors of the structure map are physically intuitive functions of the number of valence electrons, atomic volume, and electronegativity of the constituent elements. We test the structure map against standard density-functional theory calculations for 1:1 sp-d-valent compounds and show that our three-parameter model has a comparable predictive power. We demonstrate the application of the structure map in conjunction with density-functional theory calculations.